The day started badly. Halfway through cooking breakfast, the bottle we had classed as an eternal source of gas, faltered and had to be replaced by a full one. The 2nd cup of tea was postponed and could only be delivered after spanners were deployed and the smell of had gas evaporated. It was beautiful weather and we had the plan to sail pointlessly around for a couple of hours and return before the tide would become fierce. 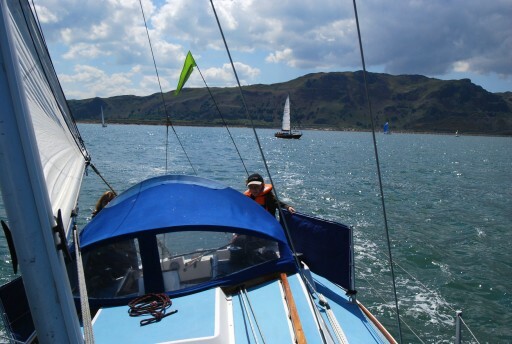 HW Conwy was 12:18 BST and we cast off around 11:30. 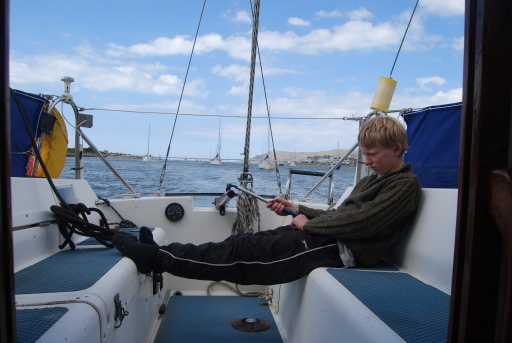 At 12:15, the pleasant sound of silence engulfed us, when we were under sail without carbon assistance. 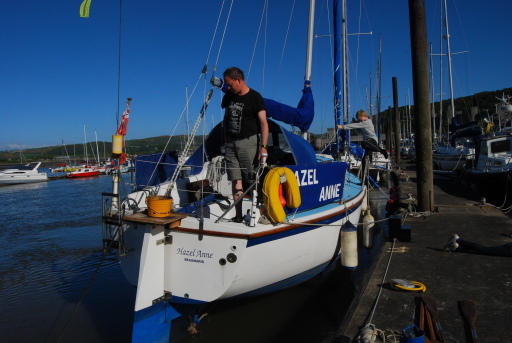 Timo did an excellent job in tacking Hazel Anne across Conwy Sands. Around 1 hour after HW we turned back towards Conwy. Various large plastic palaces overtook us, while we ran back beautifully before the wind. Just past Perch we took a 90 degree turn towards starboard, which gave us a beam wind. I started the motor... my sharp brain, as always, noticed quickly that NO cooing water came out of the stern. That put a cross through our triumphant return to the pontoon. The Genoa was unfurled again and while Geke practised sailing backwards on the little available wind against an ever increasing outgoing tide, I tried to figure out what to do next. Without much delay I decided the next best thing to do was to get my musical instrument out, as the pleasant sound of a trumpet had saved us before. This time I managed lure an inexperienced shiny motorboat captain in, who had obviously never towed anything before in his marine career. Not a good choice I hear you thinking but what do you say: “Nah, you're not good enough, we'll take the next one if you don't mind ”. So we were towed and meandered through the strongest part of the outgoing tide. I pondered what would happen if the cleat would break away from the proud owners stern and a small Titanic scene would develop before our eyes. At least I had a trumpet to provide the music for the last moments. Then, as a knight on a floating white horse, the harbour launch came towards us. It must have smelled my fear and came to the rescue. We thanked the motor boat owner but we had the distinct impression they were immensely relieved to let us go. 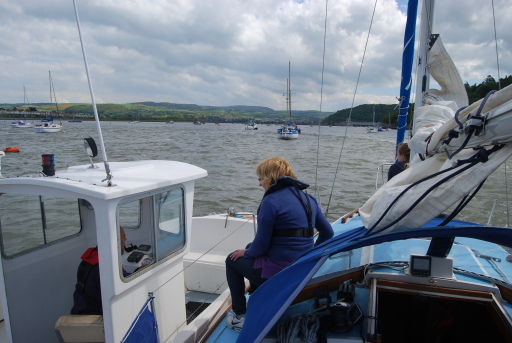 So at 15:00 we were back where we started a few hours earlier, demonstrating the pointlessness of sailing. The accusation from the Harbour launch skipper that we were just trying to save on diesel, hurt deeply. Anyway, ignoring all engine problems, as the sun was still out, we voted for a BBQ. Therefore a brief visit to the shore was required. We briefly wandered into the stands on the quays offering food, art and other things we didn't need. Next we walked up to the Spar. Timo's choice to become a vegetarian the evening before after he had witnessed the cruel murder of a bird by our cat, made the shopping choice in the depleted Spar somewhat limited. Anyway, there was wine. So we found ourselves having a very pleasant evening in the sunshine. We need to have more of those and I think I'll write a proposal to the Welsh assembly in Cardiff.